New York Fashion Week: Men’s returned for a second season with a roster of designers prepped and ready to present their Fall/Winter 2016 collections. From Joseph Abboud’s return to the runway after a 15-year hiatus to the understated, easy-to-wear garments of Zachary Prell, this particular season portrayed an almost American Savile Row effect amongst modern menswear through strong tailoring and the impeccable art of styling, each uniquely translated by these five designers. After 15 years away from the lights of the runway, designer Joseph Abboud made his return with confidence and a collection described as “American Savile Row,” as a personal ode to great tailoring, which seems to be where America sportswear meets British dandy. In addition to American flag motifs and an unmistakable Sixties touch in fits and flares, the rugged dandyism that this collection seemed keen on (even while overdressing the model with much more wearable pieces) was achieved through sport coats of washed velvets, distressed wools and tweeds. 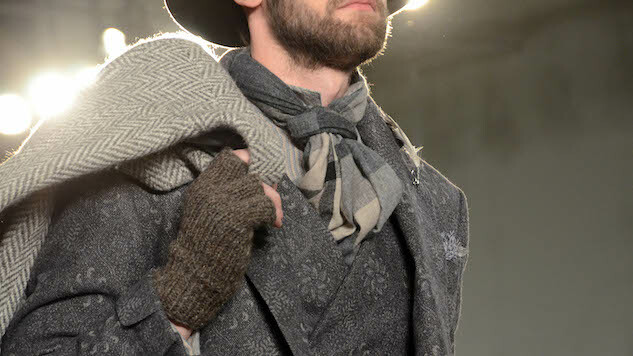 But as British inspired as it was, the collection was filled with American-made garments and accessories, including wingtip and brogue footwear by Wisconsin-based shoemaker Allen Edmonds, feathered hats by Manhattan-based milliner Albertus Swanepoel and briefcases St. Louis-based Rawlings. Nautica’s fall collection by designer Steve McSween may have been “inspired by the sea, designed in the city,” but what this season seemed apt at doing was assembling a seasonal wardrobe for the man who likes to play by the ocean. Equally elegant and utilitarian, the lineup presented at New York City’s Skylight Modern included Nautica’s signature cable-knit sweaters in lux cashmere, a mohair and merino turtleneck and a covetable winter white admiral coat made of wool. There were contrasting notes of sportswear, but nothing as well tuned as joggers in stretch gabardine. Ultimately, this was a collection with wearable knits and outerwear for the man with nautical charm. Creative director Michael Maccari continues to modernize the Perry Ellis name with his personal take on sportswear, while updating timeless silhouettes such as the heather gray wool melton robe coat that was paired with a Lurex sweater and a pleated tracksuit for the opening look. Tailored but relaxed, this season presented a collection of carrot-shapes pants alongside alpaca coats, shearlings and knits. Maccari played with the iconic Perry Ellis look with refinement and fun, going as far as pairing a plaid bomber with matching wool shorts and knit leg warmers—an unmistakable reflection of the brand’s revitalized future and energy under the careful gaze of Maccabi. Since launching the label in 2014 in Seoul, South Korea, Julian Woodhouse has continued to follow his inspirations while exploring a world in which he challenges the constructs of masculinity and femininity. Now presenting at NYFW:M Fall/Winter 2016, his label Wood House strives to manipulate fabrics and shapes in order to highlight a man’s body. This season, through an almost militant use of clean lines and a liberal use of bold hues, unique yet wearable looks (including a covet-inducing quilted jacket with side zippers) emphasized the current transition for the modern man where adjectives such as athletic and polished are now used side by side. In menswear, comfort and fit rarely stray from a designer’s mind. For New York-based sportswear label Zachary Prell, these two facets find their way into this season’s collection through understated looks and easy-to-wear fabrics that fit. Another name to add to the list of designers subscribing to the ath-leisure movement, Prell’s fall collection explored key layering pieces as well as he did lux influences. Army moleskin shirt-jackets and charcoal pima cotton zip-ups were presented alongside cashmere cable-knit sweaters and pleated pants, which appeared in dark, classic colors this season. Overall, Prell’s latest collection highlighted his own remarkable creative attitude when it comes to supplying accessible clothing for the casual man, all while staying innovative yet classic.